This double CD includes Zephirus's performances of Glazunov's Canzona from Op 109, Shostakovich's Polka from The Age of Gold and the second movement of Peck's Drastic Measures along with the other finalists of the Royal Over-Seas League competition in 2006. It was recorded live in the Queen Elizabeth Hall, London. 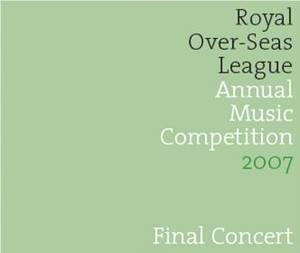 The CD is available directly from the Royal Over-Seas League. Please click here to link to their site for details of how to contact them. Alternatively call them directly on 020 7408 0214.